I have quite a lot of time for Nørrebro Bryghus beers as I work 5 minutes away from their brewpub and have been in many times for a liquid lunch after getting off work early on a friday for a sample or two. This Belgian Wit is an organic beer, the first organic to appear on this blog, hurra ? We'll see. 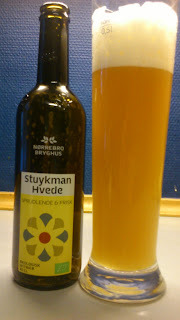 Stuykman Hvede pours hazy yellow gold with a quickly fading white head. Lightly sweet on the intake with yeast, citrus and coriander with a dry acidic finish. Coriander and black pepper linger in the short aftertaste. Quite a soft and creamy mouthfeel for a Wit. Decent enough Wit and scored 6/10 on my 'I've done absolutely nothing all day and now feeling guilty' beerometer. Where to buy CPH : Most larger supermarkets.